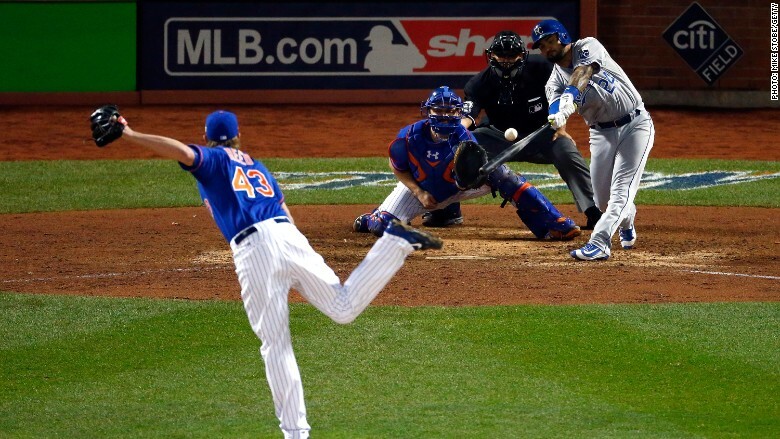 The Kansas City Royals won the World Series on Sunday night defeating the New York Mets 7 to 2. The coronation was complete for both Kansas City and Fox on Sunday night. Roughly 17 million viewers tuned in to watch the Kansas City Royals take home the World Series title in 12 innings on Sunday night over the New York Mets, according to the network. The madcap series, which saw the Royals rally over and over to beat the Mets late in games, averaged 14.7 million viewers over five games. This number was up 6% from last year's series, which went seven games and also involved the Royals, and also holds the best five game viewership average since 2009. One of the most notable viewership stats from Sunday night was that the clinching game brought in a 60 overnight rating in Kansas City meaning that 60% of homes in the city were tuned into the game. Fox said 25% of New York City homes were watching the game. Viewership for Sunday's night game peaked at 19.4 million around 11:30 p.m. EST as the game went into extra innings for the second time in the series. The viewership numbers on Sunday night are even more impressive for Fox and Major League Baseballs seeing that it went up against the ratings machine NBC's "Sunday Night Football." That game, which had the 6-0 Green Bay Packers take on the 6-0 Denver Broncos, was watched by an average of 23 million viewers.